Father Dan Schmitmeyer, the Director for Vocations for the Archdiocese, was here this weekend, preaching at all the Masses. Looking back, the last homily I preached on these readings was in 2009! Here are my notes if you're interested. 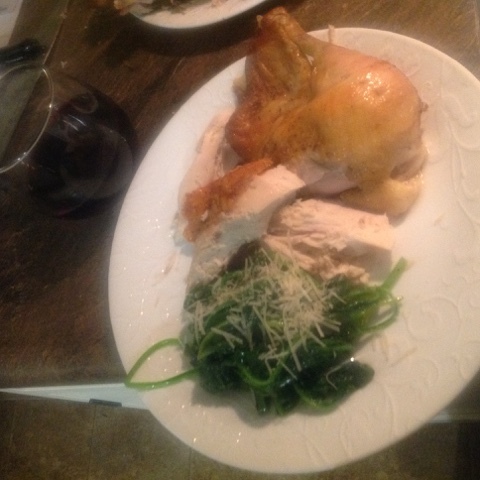 Dinner plans: Chicken a la Zuhlsdorf! Several weeks ago, I saw this recipe on Father Z's blog, and fixed it; and it was unbelieveably good! So tonight I'm doing it again. 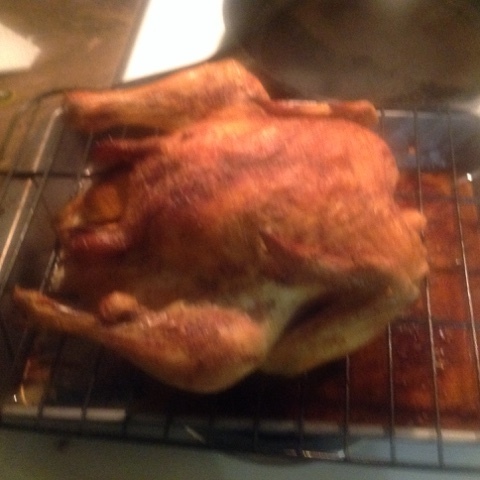 Sorry, no pictures; I was under a rush to get it in the oven in time. Admittedly, I did tweak it a little. I omitted "extra zest"; I just stuffed most of the lemon inside the chicken; and in addition to pepper on the outside, I added salt. How can salt hurt? Meanwhile, I got out some fresh spinach, which I bought Wednesday, which I'll saute with some garlic and olive oil, and then finish with some Parmesan cheese. I've made that many times. I have Mass at 7, so I hope I can get to eat some before then. We'll see! The delay was not kind to the chicken. It was a little over cooked. Not. Bad, but...it could have been much better. The spinach was delicious. The skin was excellent! Why are there so many Eucharistic Prayers? As we discussed at Mass recently, the Eucharistic Prayer is the prayer the priest offers, at the center of the Mass, recalling and making present Jesus’ saving death and resurrection. And while I almost always use the same prayer—the First Eucharistic Prayer—there are more than one. This is a development since Vatican II – and, like many things we experienced in recent years, this was a change that was not envisioned by the Council at all. The best way to understand how so many things happened after Vatican II that weren’t called for by Vatican II is to remember the times; the 1960s and 70s were a time of experimentation and rebellion – and that affected the Church. Pope Paul VI, who was pope at that time, rightly or wrongly, chose to overlook some of it; and he gave recognition to several new prayers – we call these Eucharistic Prayer numbers 2, 3 and 4. In the 1990s, several more were approved. Some are called “For Reconciliation,” and others, for “Various Needs and Occasions.” There are a total of ten options. No doubt you’ve noticed that I very rarely use anything but the first prayer, the Roman Canon. I am following the example of my predecessor, both because needless change is unhelpful; but also, because I agree with his preference. Here are my reasons. 1. The Roman Canon is uniquely a treasure of the Roman Catholic Church. The Catholic Church is more than just Roman; there are Greek Catholics, Indian Catholics, Arab Catholics, and many others. What defines them is the way they celebrate the Divine Liturgy, aka, the Mass. That is true for us as well. This prayer was always the center of our worship until 1970, and my view is it should stay there. 2. I’m not against using the other prayers; I occasionally do use them, but only where need demands it—i.e., usually the demands of time or simplicity for the sake of those attending Mass. 3. When we take part in a shared ritual action, familiarity and steadiness are very valuable. That’s how the prayers become “ours” rather than merely “mine.” Notice how, when Catholics gather, everyone knows the Hail Mary – that’s because there is only one version. Then notice what happens with the Saint Michael Prayer; there are several variations, and when we pray it together, sometimes we stumble. Then notice what happens with the Act of Contrition: there are too many variations – we don’t have one, common version. In my judgment, the Mass should be a prayer that is, to the greatest extent, something we all possess together. Obviously some of the prayers, as well as the readings, need to change. But the rest? I think it helps us not to have so much variation. --From St. Remy Bulletin, August 23, 2015. 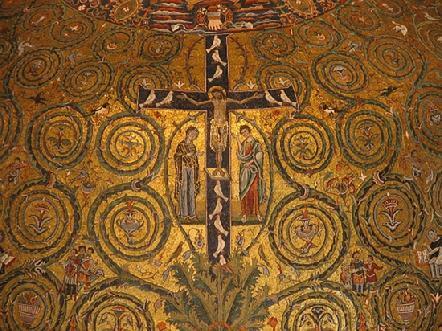 Triumph of the Cross, Tree of Life Mosaic; 12th Century; San Clemente, Rome. We have three things to talk about today. This is the last of five homilies on the Mass. And we are remembering the dedication of our beautiful church. with the Archdiocese’s “One Faith” campaign. Let’s start with the Archdiocese “One Faith” campaign. or you’ve talked with someone about it. which you’ll need in a moment. in order to strengthen four major missions of the Archdiocese. retired priests, and assistance to those in need. Our parish goal toward that was $350,000. It’s a lot of money. Where’s it going? as well as to support parish religious education efforts. this will not mean as much to us. But Catholic schools do play an important role in our archdiocese. Sixteen million will go to support vocations to the priesthood. including three just from our parish! These funds will help lower the costs to our seminarians. Thirteen million will fill a gap in the retirement fund for our priests. in serving the poorest in our Archdiocese. And then, 20% of the fund will come back to parishes for their needs. We will get a significant amount back ourselves. that we expect to come down the pike the next few years. in the next few years, and that could be very costly. with over $500,000 donated or pledged to date. why should anyone here give more? the Archbishop is hoping everyone will take part, even if in a small way. 60 cents will come back to our parish. So at this point, you should have a card and a pencil. I’d like to explain what to do with it, briefly. 1. Please fill out the left side. simply check “Amen.” That’s all you need to do. Then please take a look at your options on the back side. and put it in the collection when the time comes. Now, let me pick up the thread from last Sunday. We were talking about the Eucharistic Prayer. meaning the saints in heaven. We aren’t approaching God as slaves, but as children, at home! and then we offer peace to each other. I described Mass as an ascent up God’s mountain. Do you think I mean, “in heaven,” as a metaphor? Symbolically? No, I mean it quite literally. Yes, we’re also here on earth. We still have our trials to overcome. And that makes you and me ambassadors of heaven. that the interior was decorated with trees and animals. What place does it sound like they were depicting? With trees, flowers, fruit, animals, angels…and God? That sounds like the Garden of Eden to me. but they had been prevented from eating from the tree of life. So, when we come to the last part of the Mass, what do we do? What do we eat? Jesus told us: “I am the Bread of Life”! Yes, when we are in Mass, we are in heaven. This place, this church, is truly a bit of heaven on earth! Jesus is here; the angels are here, the saints are here. The one problem? You and I: we’re not fully heavenly. So that’s why we have Mass here, every day. That’s why the doors are open, every day. Anyone who wants to be here all night? Let me know, we’ll do it. No problem. This is why we have a Sunday Mass obligation. It’s why we have confessions through the week. We come here to soak up as much of heaven as we can, and then? To take it with us. the more people will ask: what exactly goes on at Saint Remy Church? What do they have? we go to take heaven to the world. I think many of us have heard of these devotions, but we may not be familiar with the whole story. “First Fridays” are about devotion to the Sacred Heart of Jesus. 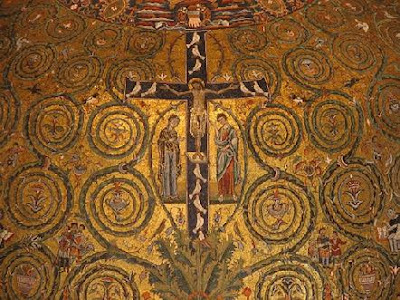 Many saints have promoted devotion to the Lord Jesus’ human heart, as a way to emphasize both that the Son of God shares our very same humanity, and also his love for us. Over the centuries, sometimes an emphasis on the authority and holiness of Jesus has obscured the reality of his compassion and mercy. The requirements are: Confession, Mass and Holy Communion each First Friday – with confession coming within eight days, before or after. Behold, my daughter, my heart encircled with thorns, with which ungrateful men pierce it at every moment by their blasphemies and ingratitude. Give me consolation, you, at least; and make known on my behalf that I promise to assist at the hour of death, with the graces necessary for salvation, all who on the First Saturday of five consecutive months confess their sins, receive Holy Communion, recite five decades of the Rosary, and keep me company for fifteen minutes meditating on the mysteries of the Rosary, with the purpose of making reparation to my Immaculate Heart. There are four elements of this devotion: first, Confession (up to 8 days before or after); second, reception of Holy Communion on the First Saturday; third, Recitation of the Rosary (5 decades); and fourth, 15 minutes’ silent meditation on one or more of the mysteries. All this is done with intention to make reparation to the heart of Mary. The communion, Rosary and meditation can take place the following Sunday “if a priest, for just cause, grants” that favor. For more on First Saturday devotions, go here. —From Saint Remy Bulletin, August 16, AD 2015. I’m going to focus on the center of the Mass, the Eucharistic Prayer. also known as the Roman Canon. I will refer a few times to the text, and you may want to follow along. To save time, I’m not going to go into the other Eucharistic Prayers. No doubt you notice I almost always use this prayer. I’ll have something in next week’s bulletin. and most likely, long before that. But we’re not sure how far back; very likely, the 300s, maybe the 200s. Before that, we can only guess. Of course, the words at the center are those of Jesus himself. since the time of the Apostles. we are hearing the voice of the ancient church of Rome. not in safety, but in fear of Roman persecution. the Mass is an ascent; we are climbing up a mountain. When we come to this prayer, we very nearly at the summit. At this point we kneel. when Moses and God’s People were at Mount Sinai. and the 70 elders of the twelve tribes, to come up the mountain. In Exodus it says, “and they beheld the God of Israel. as clear as the sky itself. Yet he did not lay a hand on these chosen Israelites. We arrive here, not with Moses, but with Jesus. The lowly priest – me – acts in his name. using me, his unworthy servant. You are like the elders—part of the sacrifice. but also for all of us, still on our pilgrimage. that is, those who have died. the Apostles, and other saints. with all the saints gathered around! The priest bows his head as he mentions Mary, and then Jesus. Isn’t that what I’d do, if they were sitting right here? They are here! All the angels and saints are present! We beg God to receive this prayer, this sacrifice. It is Jesus’ sacrifice, but also ours. It’s not. We aren’t re-creating the Last Supper. The Mass began there, but it wasn’t completed there. lives ever to make intercession for us. The Mass actually takes us out of time entirely. It takes us to heaven! The Mass is a great “summary” of all that God did for our salvation. we recall God becoming man in several points. and Jesus himself, in the readings. Jesus is the new Adam, putting right what the first Adam wrecked. the new Adam raises his eyes to heaven, and offers himself. the new Adam obeys God, even to the point of death on a tree! and bequeathed death to his family. The new Adam faces death, and in dying, gives divine life to us all! This is what we witness, kneeling at the summit of God’s Mountain. “Not my will, but thine be done”! he calls them his Body and Blood—and so they are! There is no other lamb at this Passover; Jesus is the Lamb. we are united to that moment. The priest lifts up the Body, and then the Blood. “If I be lifted up, I will draw all to me”! You will see it at the top of page 17.
and what we does in eternity as he continually intercedes for us. and his ascension back to his heavenly throne. who has been slain for us. and by the priest Melchizedek, who offered bread and wine. and what follows—have a “private” dimension. Can you see, now, why I said that? relying on the blood of the Lamb of God to plead for us. we broadcast it on TV. And yet, what do unbelievers see? They see people performing an ancient ritual. But with the eyes of faith, what do we see? WE behold the God of Israel! And we eat and drink. I described it as climbing a mountain—to Calvary. we also talked about how Scripture plays a role in the music of Mass. Now, it turns out I stirred up some people with that. Sorry about that! Let me explain my purpose. I’m not talking about turning things upside down. So I am not proposing we stop using hymns. which, by the way, we’ve used before I even got here. But yes, I did want to provoke some reflection. You and I are on a pilgrimage. We’re not at the Promised Land yet. Can we climb higher? Can we go deeper? confirmed Catholics would actually leave at this point of the Mass. Why would they leave? Think of a family. but more intimate family matters wait till the guests depart. we are entering a privileged moment. – realize the truth of it. Without the eyes of faith, people see, yet they don’t see. The mystery is hidden, despite being in full view! identifying ourselves as believers who can enter this “private” moment. we want to bring to the Sacrifice, where Jesus intercedes for us. But we know that many more prayers remain in our hearts. the question of the posture of the priest at this point in the Mass. but it actually came after. And while it’s almost universal, it’s not a requirement. At this moment, I’m facing you, naturally, because I’m talking to you. is it really you I’m addressing? Maybe you haven’t really thought about it. But at today’s Mass, pay close attention. Listen to the prayers I say there. and not to you, but to God. Here’s what Pope Benedict said in his book, the Spirit of the Liturgy. the priest…becomes the real point of reference for the whole liturgy. to be involved in what he is doing. His creativity sustains the whole thing. to downplay this focus on the priest; and I want to continue that. But let me be candid about a way Father Amberger and I are different. He’s quieter and subdued; I’m not! Priests have always had different personalities. It becomes far less about the priest! the priest himself was not regarded as so important. the congregation looked together "towards the Lord." That’s the key: it’s about all of us turning together toward the Lord. So, here’s the thing: I’m not going to make any huge change. to see what I’m talking about, and experience this. I will begin offering the Mass in this fashion. I don’t expect everyone to like it; but you may be surprised. And if Pope Benedict is right, then you will experience some benefits. Let’s continue our climb. The readings emphasize food for the journey. Jesus told the people that he, himself, is that food, the Bread of Life. two different realities come together in the Mass. We understand that the Eucharist is food; and the Mass is a meal. But what can’t be lost is that it is equally a sacrifice. God’s People in the Old Testament had many forms of sacrifice. One in particular was the todah, or a sacrifice of thanksgiving. after which, the ones making the offering would eat the sacrifice. the lamb is offered, and then consumed. incense was always offered in the temple during the sacrifices. as a sign of our prayers rising to heaven. but then the priest, and the people, too, are incensed. It isn’t just the bread and wine that are offered; we offer ourselves. speaking for the entire assembly—addresses the Lord God. It is “right and just” that this be sung, because it is so solemn. that means the new Passover, Jesus dying and rising for us. It may sound like we’re reminding God, but he already knows. Instead, it is we who are remembering. That’s what the Passover was. But we also look forward. thrones and dominions”—in other words, heaven. We aren’t journeying only to Calvary; but from there, to heaven! It’s painted up there, over the altar. as he was given a vision of the Lord. It is the song of the seraphim. but we never hear it; so we sing it ourselves. In a conversation the other day, a parishioner in his 20s asked me, "How do you keep up on the news? What sites do you go to?" At first, I was a little surprised by the question; but then, after thinking about it, why should I assume everyone is a news-consumer in the way I am? So I thought I'd do a post about the more significant sites I rely on for news. Be advised! This is not an endorsement of any of these sites! I provided some notes below, to explain my choices. The Cincinnati Enquirer -- hometown paper. Crux -- a middle-to-liberal Catholic publication. Seems to be positioned as NCReporter without the crazy. The Daily Beast -- liberal gossip page, run by and for dimwits. Why do I read it? I want to know what they're saying. The Drudge Report -- the originator of the news aggregation method. Instapundit -- another aggregator, except it also includes brief commentary, which is usually very funny. The host, Glenn Reynolds, is a libertarian law professor with eclectic tastes. National Catholic Register -- a faithful Catholic publication, owned by EWTN. A good site, but not a large amount of news coverage. National Catholic Reporter -- would be better termed National Heretical Reporter. Why do I read it? Two reasons. First, because they do cover a lot of stories. Second, because I want to see more than my own point of view. National Review Online -- conservative publication, with commentary on news, politics and religion. Especially good for judicial news. RealClearPolitics -- disregard the name; it has pages of content on literature, science news, public policy, education, religion, history, technology, and more. Whoever runs this does an excellent job aggregating lots of straight news and opinion pieces, both left and right. The Washington Post -- it's the Washington Post. The Week -- a newish publication; tends to be liberal, but has conservative content. Now, if anyone is keeping score, you'll notice I access material from across the spectrum. And these aren't all the sites I visit; they're just the main ones. I’m looking closely at the Holy Mass. which goes beyond the readings. and yet it is one, sustained prayer, from beginning to end. one of the principal ways we cultivate this sense of unity is with music. may be different from what expect. as something that’s added to Mass. but it’s not what we’re supposed to do! But rather simply to pray the Mass, sometimes in a musical form. In other words, singing the prayers of the Mass. it’s the book with all the prayers needed for Mass. This is the lectionary, which has the Scripture readings. of both these books, for your convenience. if not every time, then at least on special occasions. the readings would be chanted, not simply read. I doubt our readers will be doing any chanting! if everything were chanted, until you sat down for the homily. Two things would be much clearer: first, this is one, sustained prayer. Second, we’re doing something really important. which is why we don’t do it all the time. but rather, we simply sing the Mass. So where do the hymns we use at Mass fit in? does not envision us singing hymns at Mass! Let me pause and explain two terms here: first, what’s an “antiphon”? the part you sing is an antiphon. And what is the Graduale Romanum? of such psalms with their antiphons, set to music. (4) another liturgical chant that is suited to the sacred action…. When we use hymns, we’re choosing option 4.
as the opening chant or song? and then the communion chant. or perhaps just the choir—chanting a psalm; not a hymn. Why does the Church want us to do this? The difference, of course, is that one is the Word of God. So why did we ever get to using hymns all the time? The answer involves some history. rather than sing the chant which was in Latin. and in any case, that same custom found its way to this country. you would still sing hymns in English. guess what wasn’t translated right away? Those collections of psalm texts I mentioned. and then also set to music. that these collections are easily available, in English, set to music. It’s easy to see why something familiar simply continued. but it’s the option of last resort. that the Church encourages us to use. while the choir or the cantor would sing the rest. Look, I’m not proposing a sudden or drastic change. how we can move toward using psalms as the Church envisions. That doesn’t mean we’d never use hymns, but use them less. Let’s talk about the Scripture we just heard. but I think they’re about something else: about trust. and yet it didn’t take long for them to turn ugly: not much trust. It’s what Christ does to save us. Part of that is asking us to stop, sit down, and listen. But to really listen is to be truly open. Will we let the Word of God challenge us, and change us? if we aren’t open and yielding. Recall Jesus’ parable of the farmer sowing seed. only a part of the field accepted the word, and it sprouted. What will you and I allow to sprout in our lives? In the post from the other day about the Church's teaching on homosexual behavior, a couple of commenters raise questions about a perennial argument that comes up in various discussions about Catholic teachings that aren't universally acclaimed. I can hear some of my more liberal Catholic friends saying that Jesus was only speaking in the context for that time in History and if He were with us today He would speak differently. These are pretty common arguments; I imagine a lot of us have heard them. People make them sincerely; and a lot of people seem to think they're pretty good arguments. They are very poor arguments. Here's why. The first one is basically an argument from silence. Namely, that Jesus' silence means he either didn't care about that issue, or else...what exactly? That's the problem with an argument from silence. What, exactly, does it really prove? And, as stated, the first argument isn't even accurate in a meaningful sense. To be precise? Well, yes; the word homosexuality doesn't appear, because it's both an English word, and it reflects a modern way of thinking -- in terms of a homosexual identity or orientation. So, yes, there's no exact Hebrew or Greek corresponding word in the Bible. But it's totally nonsense to suppose that homosexual acts aren't talked about in the Bible. So, to be plain, it's not a serious argument. And, if the person making that argument is a serious person, it would be fair to say that, in a charitable way. "My friend, you're smarter than that. Let's try for a more substantial argument than that..." And then, explain why the argument isn't serious. And both arguments have another problem: the unstated premise, which needs to be brought to the surface: why does it matter what Jesus thought/said/taught about this? It matters to me, as a Catholic, because I believe Jesus is God incarnate. Everything stands or falls on that act of faith on my part. Does the person asking the question believe Jesus is God incarnate? It makes no sense to care only what the Gospels say, and set aside the rest of the Bible. If Jesus is God, then did he not -- as the second Person of the Trinity -- answer the question about homosexual behavior in what was said elsewhere in the Hebrew Bible? And then there are those who like to say the Gospels are one thing, but Paul's writings are another. But again, this is silly. What makes you think the Gospels are reliable? Where did they come from? Jesus never wrote a word of them. You know who did? The Apostles, or those closely associated with them. So if you think the Apostle Paul is unreliable, why do you consider the Gospels reliable? Who cares what he thought? Why should anyone care? > Why should I bear the burden of proof about what Jesus believed. You think he didn't object to homosexual acts? Prove it. What basis, exactly, do you have to such an extravagant supposition? > Suppose -- for the sake of argument -- that I pointed to indisputable evidence that Jesus, did, indeed, believe X (whatever is in dispute). Will that new data change what you believe? See, my guess is that the question is a dodge. The one asking it isn't really going to say, "wow, Jesus did say that--so I will now agree with the Catholic Church!" Instead, I think it's far more likely that the person will say, "Bummer. I don't like Jesus as much, then." Now, I don't mean to assume everyone who asks these questions is insincere. Mostly, they aren't. But often people are not asking the right question. So why waste time and energy on the wrong one? So my suggestion is to cut to the chase and ask: What difference will it make to you to know that Jesus did, indeed, teach ____? In the end, the only question that matters is what Jesus asked Peter: "But who do you say that I am?"